Our Thanksgiving dinners are so popular we have added a day to avoid disappointment. However you should still reserve early to guarantee a spot! A traditional full course Turkey dinner includes roast turkey, stuffing, mashed potatoes, stuffing, seasonal vegetables, gravy, cranberry sauce, dinner roll, dessert & beverage. It’s never too early to call to book your seat at out table. 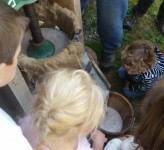 On site we will have an apple pressing demonstration each day at 1:30pm on our 110 year old press.